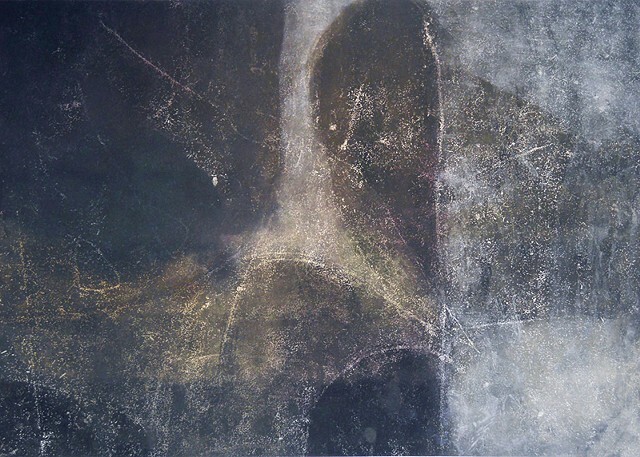 I make large-scale etchings of dreamlike spaces, enlarging small moments from one piece to form the basis of another. Finding the large in the small is a metaphor for daydreaming in my work. I select small details, then scan and alter them digitally, enlarge them onto etching or lithographic plates, etch and re-etch them, scrape away, build back up, reshape. I change the images over many iterations, allowing for landscapes to emerge and transform as I alternate between letting the space reveal itself and authoritatively shaping it. In the end, the resulting pieces no longer reflect their original sources. They depict abstracted, emotional, and ambiguous landscapes, peopled with strange figures, objects, and architectural elements. They convey emotions open to interpretation: sadness, contemplation, awe, calm, solitude, hope, or a sense of searching.